Last month, I watched the finest dvd ever created. Ever since, I’ve been counting the minutes until I can get back on the rugby pitch. Needless to say, now that I have, I really wish I hadn’t. On saturday, we had a fitness test to set a baseline for the upcoming summer’s endeavours. Of the people who were there, I knew that I’d perhaps fare a little worse than the 9 stone 16 year-old. Seeing as the session was 2 days ago, and that even now, I’m in such splendidly searing agony that even writing this post is making my fingers hurt, I’m pretty sure that was indeed the case. Knowing the fitness coach, I’m pretty confident that I’ll be spending the next 3 months mainlining ibuprofen. On a slightly more worrying note, the friday just gone was the last day in the next 9-10 months that I’ll spend not hurting. The rest of the preseason and season will be spent cramped, with aching muscles, bruised, and generally feeling sorry for myself. But, as ever, would I have it any other way? Of course not. This season, my own personal Everest may come. I need to make sure that I’m ready. 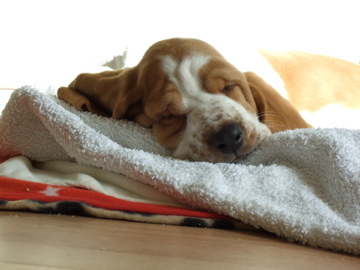 This is Wilbur, my new pedigree Basset hound puppy. Yes, Wilbur is my only reason for taking any time off work, and I think he’s the best reason anyone could imagine for any annual leave. Wilbur is—quite simply—the most beautiful, loving, yet utterly terrifying animal I’ve ever seen. The Wilbur Switch has two settings; Hyperactive, and Asleep. Right now—of course—he’s asleep. 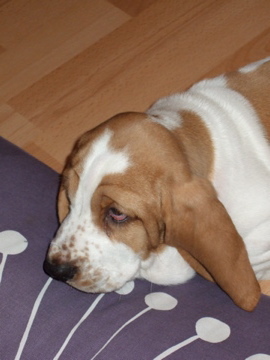 When Clair and I first set out buying a puppy, we soon decided that a Basset was the dog for us. They’re loving, trusting, pretty docile, and—let’s face it—pretty easy on the eye. To get in touch with him, we first contacted the Basset Hound Club, who put us in touch with a couple of proper breeders. This, by the way, is the route which I’d advise anyone wishing to get a dog—any pedigree dog—to take; speak to someone who knows an awful lot more about things than you do, and take their advice. We found a breeder who we liked—and who liked us—and got on the list of people earmarked for one of their beautiful litter. Eight fraught weeks and a couple of hundred miles on the clock later, what we have ended up with is a dog which has been brought up in a loving family environment, surrounded by its littermates, constantly handled by children, and pretty much house trained. Added to that, he’s spectacularly smart, and the only animal I’ve ever seen who can tread on its own ears. To say that I’m captivated by him is an understatement. This captivation, however, is not without its price. I’m so eager to do everything right for the hound that it can get a bit overwhelming. I’ve never exactly been one of life’s worriers, but now that there’s this little, beautiful, precious life depending entirely on my actions, it does rather divest me of my laissez-faire predisposition. Yes, he’s had a few accidents indoors, but those can be attributed to my inexperience in reading his signs as much as they can to The Hound’s bladder. He’s scratching a bit, but with so much skin, and so little dog, that’s natural, isn’t it? How do I know he’s content, and not just crazy and anxious? Am I feeding him enough? Am I feeding him too much? Does he really like processed cheese, or is he just being polite? I’m sure that the anxiety will wear off in time. After all, this is Wilbur’s first time, too. So we lost. We’re out of the cup. But as the converse of hollow, boring wins, what we did yesterday was fantastic. Taking on a better-prepared, (better-)paid team, we showed up, and gave them one hell of a scare. Without resorting too much to the world of sour grapes, if a couple of dubious referee’s decisions had gone the other way, I honestly think we could have taken it. We played pretty much according to plan. We were nasty, uncompromising, disruptive, and played in all facets as if we wanted the win more. In the forwards, we dominated everything. In the backs, every man left everything they had on the pitch. I even got to unleash my rapier wit. As we limped and hobbled our way back to the coach, we did it with the warm glow that not one of us could have done anything more than we had done. We shared a few pints on the way home, in a coach unrecognisable from the one in which we arrived. Everyone was sat together, all having a laugh, all members of a team beaten but unbroken. It’s the biggest match of the year. We’re a diverse team; some older and some younger. Some short and some tall. Some fat and some thin. Some black and some white. What brings us together is the black and white hooped shirt we wear on a saturday afternoon. In just over two hours we kick off against a team from just up the road, where players are paid formidable amounts of money to play the game we play for free. Slowly trickling to our home club, we mill around, swapping jokes about last week’s match report, swigging Lucozade, and throwing a ball around. We’re all wearing the team mufti; a black hooded top with the club name and a few logos on. We look good. Like a team. Some of us are starting to think ahead to the game. On paper, they’re the better players. But we know we’re the better team. Our best hope lies with rattling them a bit. Getting under their skin. If we can put them off their game enough, we’ve got the skill to take them. It’ll be close, but we can do it. We’ve been told we can do it, and we’re starting to believe. The coach is here. There’s no turning back. Once we’re on, the mood starts to change. Some players quieten down, some become more boisterous. Some lean over the back of chairs to join the banter. Others retreat into the world of their iPods. The King is keeping me mellow as the countryside drifts by the window. I say nothing. I know my job; it’s a simple one. All I have to do is to be better than my opposite number. I know that he’s out there somewhere thinking the same thing. But I can’t let him. I refuse to let him. My friends on the coach expect this of me, as I expect it from them. Closer to the match, the coach goes quiet. We want this win, and to get it, we have to concentrate. I look around, into the eyes of my friends. As I look, I see the unification of desire, and of purpose. We all want the same thing, and in just under an hour, will be giving everything we have to get it. As we pull into the opponents’ club, we stand as one, resolute in our purpose. I know that there’s nowhere else in the world I’d like to be more than where I am right now. I love this game. I bloody love this game.